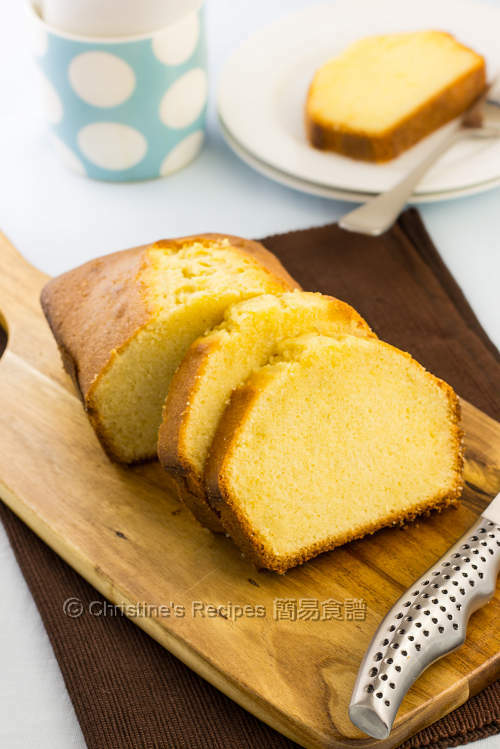 This butter pound cake has a strong aroma of butter. Mind you, it's so addictively delicious. Its simplicity, without any fancy decoration, with the golden brown crust, buttery taste and rich texture, totally wins my heart. Butter pound cake is my favourite childhood dessert. I remember how the strong aroma of butter made this traditional cake so addictive to me, feeling like never having enough of it. Its simplicity, without any fancy decoration, with the golden brown crust, buttery taste and rich texture, totally wins my heart. You can’t stop eating after tasting the first slice. Mind you, if you’re on diet, make sure you can share with some other friends, or bring it along to any parties as finger food. 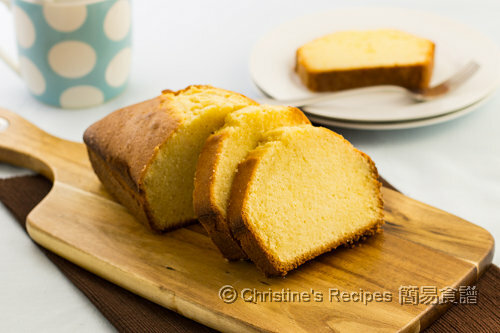 One slice of the butter pound cake, with a cup of tea or coffee, brings me enough enjoyment with no regrets. Prepare oven to 180C / 356F. Place the butter at room temperature until softened. 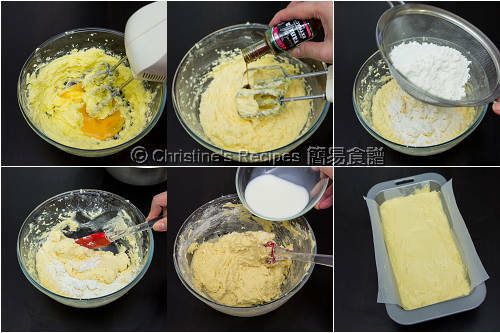 Sift the cake flour together with baking powder and salt. Set aside. Line the pan with baking paper or spray the bottom and sides with oil. Beat the eggs and drain through a fine sieve to remove the foam. Beat the butter in a large bowl with an electric mixer at low speed until smooth. Add the sugar and beat at medium speed. Then increase to high speed and continue to beat until very pale and creamy. Scrape down the sides of the bowl occasionally. Add the beaten eggs, in 3 additions. Beat well after each addition. Beat in the vanilla extract. Sift in the flour mixture, in 3 batches, and gently fold to combine with a spatula, scraping down the sides of the bowl occasionally. Add milk and quickly combine into a smooth batter. Make sure not to over-mix because you don’t want your cake turns tough. Scrape the batter into the lined pan. Level the surface with a spatula. Immediately transfer into the preheated oven and bake for about 20 minutes. When the sides start to set, remove the cake from the oven. Use a sharp knife to draw a line in the middle. Put it back into the oven. Reduce the oven temperature to 170C / 335F. Bake for another 20 to 25 minutes, until the cake turns golden brown. Insert a needle in the center. If it comes out clean, it’s done. Remove the cake from the oven and let it cool on a wire rack for about 5 minutes. Remove the cake from the pan and let it cool completely on the wire rack. By cutting a line on the surface of batter, your cake will crack beautifully along the drawn line after being heated up in oven. Delicious! I can feel the butter clogging up my veins, but a little indulgence isn't going to kill me (probably). I recommend adding toasted walnuts, pecans, and soaked craisins for an incredibly nutty aroma. Also, 175 grams of sugar, which I reduced to 143 grams, was too sweet for my family's tastes, especially because I added the craisins. I think I'll go with 120 grams next time and add a few squirts of agave nectar instead. I love your recipes, Christine! Thank you, and happy baking! For the cake recipe, how much is 200g of cake flour in cups? Is this 1 3/4 cups? I have made cakes in the past and it was very dry and hard, worried that it's the amount of flour I put in and the over mixing. For baking, it's better to use the weight measurement, in grams rather than in cups, as you don't want to risk your products due to any calculation errors. My oven is only 35 litre, after 20 min, the surface turn brown very fast, and my butter cake seems dry the next day when eat. Is it because my oven too hot n over baked? Do I need to lower the temperature? Every oven performs differently. So you might adjust the temperature and baking time to suit your situation. If the surface of your cake turns brown too quickly, you can lower the oven temperature or loosely cover with foil. I tried a few of your recipes and I like it very much. I tried the butter pound cake last night. The look and taste was good. However, the texture came out too light that once I put in the mouth, it breaks into very small pieces making it a bit 'powdery' feel. Any idea what went wrong with this? Did I over beat? Different brands of flour might have different water absorption rate. You might add a bit more milk or water if you try next time. When the cake is heated up in the oven, the surface will crack along the drawn line. Think that it looks better and similar to the ones I tried in Hong Kong. Otherwise, your cake will crack wherever it "likes". Hi Christine, can u let me know wat type of milk shld I buy? I used fresh full milk to increase the fragrance. i did not cut it in the middle but my cake didnt crack.is there any problem? Can u suggest an egg substitute for this recipe ? Can you eat this cake after it cools or is it better to rest it for a day for the flavors to develop? This butter cake can be served hot or warm as the butter aroma will be better. Yes, you can use plain flour instead. The texture of the end product will be a bit different if you don't mind. can we use our rice cooker to make? Haven't tested this recipe with a rice cooker. Sorry, can't tell. I ended up cooking this for about an hour. It turned out perfectly--soft on the inside and crunchy on top. Thanks for the recipe! Hi Christine, after baking the cake, how should we store it? should it be put into the fridge and warm it when serving or we should just put in air tight container at room temperature? My end product tend to have moisture at the site corner or bottom. Try twice remain the same. may I know what wrong? The material of baking pan might impact the end result. You might change to another baking pan made with different materials, or bake longer time next time. See if it helps. Hi Christine, I have always enjoyed your recipes and as someone new to cooking, I am very proud to say that I have produced quite a number of successful dishes based on your recipes. Except this pound cake. This has been my third attempt, and it is even worse than the two previous ones. Put simply, it collapsed in the middle, and when I cut it open after cooling it down, it looked all wrong - very oily especially down at the bottom, and it felt very "heavy". I took one bite and it was rather chewy too. Could you please tell me what went wrong??? Did your batter split or separate? When adding in the eggs, it shouldn't be too fast or in one go. When folding in the flour, just combine it. Don't over mix it. Or else, the texture will turn tough. It looks very nice, Christine. Mind to share which brands of butter u using? Last time I used SCS butter, its too milk taste. I used Beautifully Butterfully unsalted butter from Aldi, a supermarket here. Hi Christine, successfully make the cake just the skin a little bit hard. Is that over bake? Was your oven temperature a bit higher or baked a bit longer? If so, the crust would turn dry and hard. Hi Christine, may I know if the texture of the cake is like Sara Lee? Thanks! Sorry, not sure what texture of Sara Lee is. Hi Christine, I've tried the recipe and failed a few times. The cake collapsed in the middle and the bottom of the cake is damp. Otherwise the cake tastes good. May I know what did I do wrong? Thank you! Wondering if you have beaten the butter and sugar well enough. This step is very crucial. This cake won't easily tend to shrink at all. If the bottom of your cake is damp, it's not cooked through yet. You can bake it for a longer time. If you've already baked for quite a long time, then check your oven and see if the heat elements underneath work properly or not. Hi Christine. I do not hv an electric mixer could i use the manual beater to do it? and when baking the cake we shld place it in the bottom or middle of the oven? do u hv any good electric mixrer brand to recommend for a beginner like me? Sure, you can beat the butter and sugar with a balloon whisk manually. Although it's quite a tedious job, it's possible to beat them into a fluffy stage. For the folding job, you just need a spatula to incorporate all the ingredients. That's it. I just use a very cheap, non-brand electric mixer that was bought from Hong Kong many many years ago. It's still serving me well. As a beginner, I think you won't need an expensive one to start with experiments. Go to nearby electric shops or ebay, it's not difficult to find a decent electric mixer. Dear Christine, I was tried to bake this cake and its so yummy, delicious. And my girl loved it so much. Thanks to share the recipe. So glad that your girl loved it. Thanks for letting me know. Very encouraging. If i were to use self raising flour instead of cake flour, will it be ok? The texture won't be the same if you don't mind. hi Christine, what if i substitute half of the butter with margarine? I won't recommend using margarine instead of butter for making this cake. Not only the cake will lose the fragrance, but also the texture won't be up to your expectation. Sorry, can't tell because I haven't tested this recipe with agave honey. 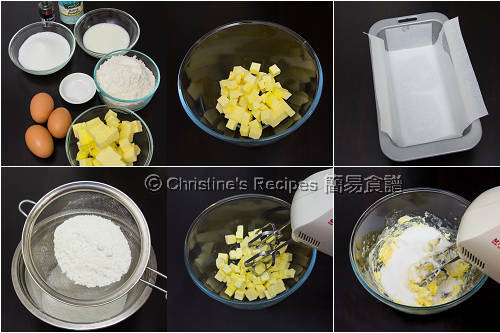 Hi christine... May i know what is the difference between cake flour n self raising flour?? Is it ok if i omit the baking powder if using self raising flour?? Cake flour is low-protein flour. Self-raising flour has mixed a raising agent, like baking soda. So if you use self-raising flour, you can omit the baking powder yielded in the recipe. The texture of the end product will be slightly different though. Hi Christine,may I know whether high grade flour = high protein flour? Not sure what high grade flour means. It could be referring to the quality of the flour. Different brands have different labels that are various in different countries. High protein flour contains higher percentage of protein inside, around 12.5% to 13.5%. You can check the ingredient labels on the packaging. Hellow christine, i have tried your recipe, the texture is very nice :) but when i am preparing the ingredients, i was wondering, for the beaten eggs, when i sieved it, there is lump of egg white being uphold on the sieve, cant pass through, is it suppose to be like tat? or should i put the egg white back into beaten eggs? I won't worry about the lumps of egg white for making this cake. It won't impact the end result a lot as long as you combine all the ingredients well together. The key to making this cake successful is to beat the butter with sugar well enough until pale and creamy, or so to speak, fluffy. This kind of cake is not as fluffy as a chiffon cake. It's normal if some small pieces drop just like muffins always do, as long as the problem is not too serious. Think that the brown sugar you added didn't make a difference. It could be the combining step bringing effects into producing the texture. You're welcome. Glad that you liked it. May be you can keep the ganache to the last minute to serve. Or keep your decorated cake in an air-tight container. I am trying to find cake flour. Are you able to post a picture of what the packaging looks like in the asian shops? I guess you might not be able to find the brand I used. It's a local brand, so I didn't post a photo of it. It doesn't matter which brand you use. Just find the flour with low protein content, about 7％ to 9％. Check the ingredient labels of the packaging. Love this recipe! May i ask if i use a round pan how do i cut the cake after 20 minutes of baking as you suggest? Thanks again for your many wonderful recipes! You may cut a little cross in the middle or just let the cake crack naturally. Hi Christine, I successfully tried baking this butter pound cake. It is soft & moist. Thanks for the recipe & step by step guidance. So glad that you liked this recipe ! Congrats on your success. Is "gm" stands for "gram"? Because it's not 100gm it's 100g. Thanks for your feedback. Yes, on this blog, gm = gram. I've already put the abbreviations on the sidebar. I know many sites use 100g instead of 100gm. As my friend said she once mistakenly took "g" in number, and felt hardly see clearly on screen, so I changed g to gm many years ago. And there's a large site in Australia, Gourmet Traveller, also uses gm. Hi, can I make this into muffin? Thanks. Hi Christine, would like to know whether the cake flour that you have used...is a self raising flour? Thanks. Cake flour is a kind of low-protein flour, without any raising agents in it, different from self raising flour. You can get it from any Asian grocers or bakery shops. I just made this cake 3hrs ago. I have no words to express. The texture, taste, softness, colour all has fallen in the right manner. It's just marvellous. I only have few slices left. Hats off to your recipe. Thanks so much. Mrs Syed.